Home / Ovens / What is a Fan Oven? And should you buy one? Fan ovens, as you might expect, come with fans built into them, which help to make cooking faster and easier. But why is this? And what different sorts of fan ovens are there? Before we go any further, it’s worth addressing a possible source of confusion – the difference between a fan-oven and a fan-assisted oven. In a proper fan-oven, the heating element will be wrapped around the fan, so that air is constantly blowing around it. 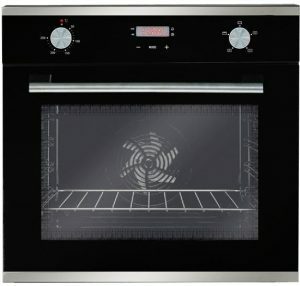 In a fan-assisted oven, however, the elements will be at the top and the bottom of the oven as they are in a traditional oven, with the fan simply helping to distribute air around the interior of the oven. In a proper fan-driven convection cooker, both the heating element and the fan itself are found not inside the oven’s cavity, but rather outside in a separate chamber. Air is drawn out through a hole in the rear of the oven, before being pushed back into the cooking chamber via a series of holes. The result of this is that heat is more evenly distributed, and you’ll be able to cook sweet and savoury foods at the same time without risking cross-contamination of flavours. This is because the small particles of food released during cooking won’t be free to simply remain in the compartment, moving from one food to another – they’ll be immediately sucked out, filtered and recirculated. Do fan ovens cook faster? Fan ovens are capable of reaching the desired temperature more quickly, and will achieve an even temperature throughout the cooker within just a few minutes. This is because they circulate hot air around the chamber. They’ll also blow that hot air directly over the surface of the food, meaning they’ll cook faster, too. Do fan ovens cook evenly? Since a fan oven will heat the air outside your food much more quickly than an ordinary oven, it follows that the parts of your food closest to the surface will cook faster than the parts on the interior. 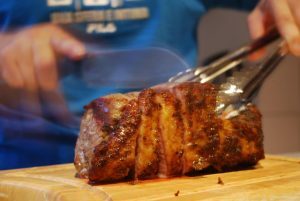 If you’d like to cook a piece of beef so that it’s nice and rare on the inside, and yet crispy and charred on the outside, a convection oven will allow you to do so. Moving warm air will help to remove moisture from the surface of your food more quickly, achieving the crispy, dark finish that so many recipes call for. Of course, this might not always be desirable – if you’re cooking a piece of chicken, for example, you’ll need to ensure that it’s cooked all the way through. Cakes, too, are sensitive to differences in temperature from one part of the oven to the other. The solution? Lower the temperature slightly, so that the interior of your food has time to reach the same temperature as the exterior. It’s not always clear how much you’ll need to reduce the temperature for fan oven cooking – and the precise amount will depend on the model of oven you’re using, and the model used by the person who wrote the recipe. When it comes to ready-made meals, like supermarket pizzas, the instructions typically call for the cooking temperature to be lowered by around 20°C, and this is a good rule of thumb to apply to all your cooking. Wide selection of ovens available with free & fast delivery when you buy online today at Ship It Appliances. Don’t miss out! If you have a fan oven, then it should be obvious from the moment you turn it on – the fan will whirr into action, and you’ll be able to hear it from the outside. You needn’t turn the oven on to find out if it’s fan-equipped, however – there should be a little fan symbol on the outside: a three-pronged fan for a fan assisted oven, and a three-pronged fan inside a circle for a fan oven. This symbol is useful if the oven itself is broken, or if you’d like to know whether your oven is a proper fan-oven, or is merely fan-assisted. How much electricity does a fan oven use? One of the main advantages of a fan oven is that it’ll lower your energy bills. While making a fan spin around does require energy, it’s only a very small amount – and one which is more than offset by the reduction in cooking times which a fan-assisted oven will achieve. The cost of running a fan oven for one hour amounts to less than fifty pence – but naturally, you won’t have to run it for the same amount of time as the other sorts of oven you might consider. How long does a fan oven take to preheat? To consistently (and safely) cook food, you’ll need to bring the oven up to the required temperature before you place the food inside. This means not only that the heating elements are properly warmed (which takes mere moments), but that the entire interior of the oven is warmed, too. Obviously, a fan helps to speed this process considerably, as it’ll move air away from the heating elements, ensuring that heat is distributed as quickly as possible. Your oven should indicate, typically via a light on the front panel, when it’s at temperature. If not, you’ll want to use an oven thermometer. This generally takes around five minutes, depending on the size of your oven. How long does a fan oven take to cool down? While the fans in a fan oven might help circulate the air around the heating elements more quickly, they’ll have little effect on how long it takes for the oven to cool back down again. This will be determined instead by the insulating performance of the oven’s exterior.